On April 13, 2019, UVCB is proud to present our spring concert, Celebrating Community. Featuring selections by Ticheli, Copland, Ives and more, the band will honor the impact that music has on our homes and our relationships with our neighbors. UVCB is proud to announce that Good Neighbor Health Clinics will be enjoying the company of the band for this concert. Representatives of the Clinic will share information about the great work they do at the concert, but you can also read about their efforts by visiting their website, www.goodneighborhealthclinic.org. The concert begins at 7:30 pm at the Lebanon Opera House. Tickets are available at the Lebanon Opera House’s website, lebanonoperahouse.org. Admission is $10 per person; free for students and children. 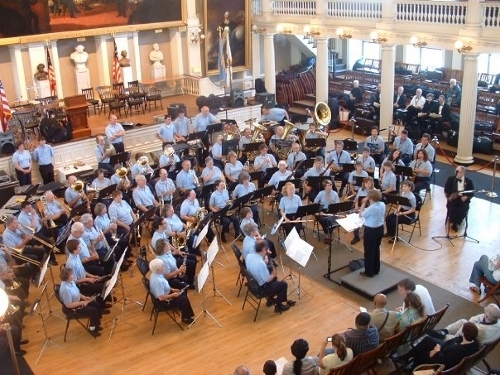 The Upper Valley Community Band is based in the Upper Connecticut River Valley of New Hampshire and Vermont. UVCB members are area residents who love music and want to share that experience with our community. Members have varying levels of skill with their instruments – the only criteria to join are the ability to read music, the ability to play your chosen instrument with accuracy, a desire to share your love of music with other musicians and our audience, and the willingness to perform in public! Our members run the spectrum from amateurs to professional musicians, who blend their talents to offer concerts in January and May at the Lebanon Opera House, as well as a variety of concerts and outdoor events every summer throughout the Upper Valley. Please feel free to email us at uppervalleycommunityband@gmail.com with comments, criticisms, suggestions, or praise!